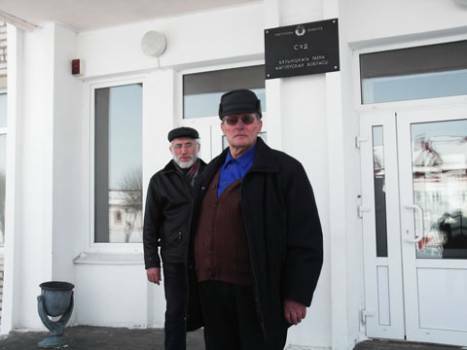 Bialynichy district court continued yesterday the consideration of an administrative case against a resident of the village of Lebiadzianka, Valery Vusik. As a result, Judge Aksana Zahorskaya ruled to dismiss the case, rejecting the presented police reports. The Court considered two police reports of administrative violations (defamation) allegedly committed in February by Valery Vusik against former chairman of the Lebiadzianka state-owned farm Piotr Bialou in a publication in the newspaper Mahiliouski Vybar (“Mahiliou Choice”) and on the website zapraudu.info in an article entitled “What Has Changed in the Last Few Years on Lebiadzianka Farm”. The other charge dealt with violation of Article 17 of the Mass Media Code when distributing the independent weekly. Mr. Vusik’s representative argued during the trial that the article did not contain the features that were reflected in the police report of allegedly slandering the former chairman of the state-run farm. The lawyer also stressed that the restriction on the dissemination of information is inadmissible, since our country signed the International Covenant on Civil and Political Rights. Par. 2, Article 2 of the Mass Media Code states that, “when an international treaty of the Republic of Belarus establishes rules other than those provided for in this Code, the rules of the international treaty of the Republic of Belarus shall be applied.” Therefore, there can be no question of any breach of Article 17 of the Media Code when distributing the Mahiliouski Vybar newspaper. As a result, the Judge ruled to dismiss the administrative case against Valery Vusik. It is not known yet whether Piotr Bialou will appeal the ruling to Mahiliou Regional Court.